Each fall, Chabot families are asked to join the Chabot PTA. Parent participation is a big part of what makes Chabot such a great school. Your membership gives you the opportunity to vote on how PTA funds are used and helps support the educational goals of the school’s teachers and administrators. Annual PTA membership costs $10 per person, and all adults in our school community are encouraged to join. PTA Membership lasts one year and must be renewed annually. Our membership goal is to have 100% of parents, teachers and school administrators join the Chabot PTA. PTA Membership is separate from the Annual Fund Drive. Please participate in both. Click the button below to use PayPal to make your secure online PTA membership fee payment to the Chabot PTA. In person with cash, check or credit card during Registration or Back to School Night. Click here to download the PTA membership form in PDF format. Completed forms may be dropped off at Registration, Back to School Night, or anytime in the PTA box outside the main office. 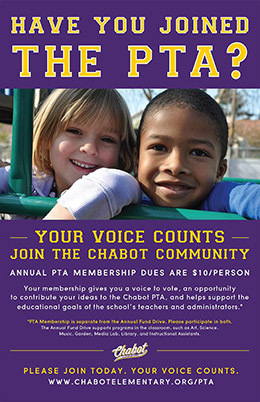 Use this button to join the Chabot PTA (PayPal account not required). Annual PTA membership costs $10 per person. Please contact Annual Fund Co-Chairs Deb Kong, Meghan Horl, and Greg Kato at annualfund@chabotelementary.org. PLEASE JOIN TODAY. EVERY VOICE COUNTS.